My question is, what are the expectations (or design guidelines) for using the severity button classes with a premium theme? Shouldn't the default severity buttons work just fine straight out of the box? 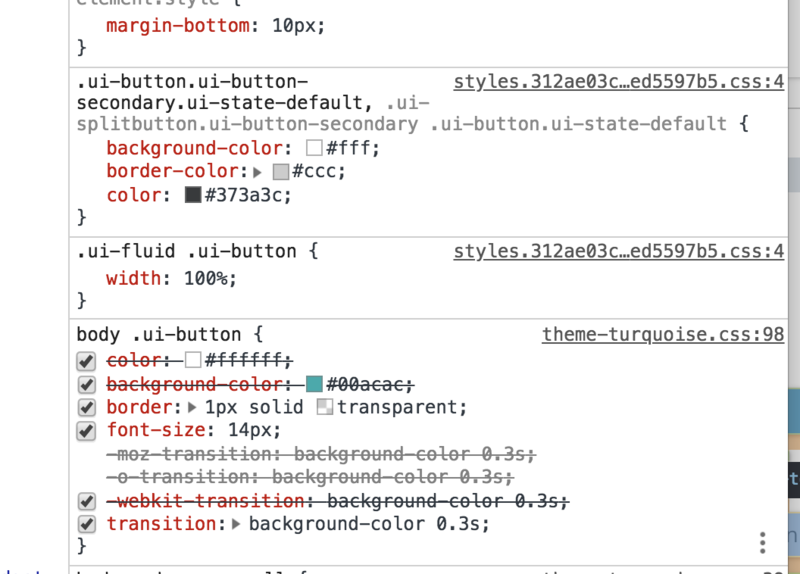 Do you have any plans or suggestions to map the premium theme color scheme to the severity buttons (for instance, the color for pink-btn used for ui-button-danger)? I arrived at this question because I noticed that in PoseidonNG, on a button with a severity class, clicking then moving the mouse out of the button causes the button to have the primary color of the color theme. I agree with Sasha, we currently hit the same issue. I think it should work out of box. I agree, we'll add support for the next version to map the severities to the color schemes. Hello, I updated to Poseidon 4.2.0 with PrimeNG 4.2.2. It does not look like this has been addressed yet. The biggest challenge to using the severity buttons in Poseidon right now is, as bossqone illustrated, the button's background color changes to the primary color on Focus. It looks like all that would need to be done is to add the rules for "ui-button-danger" and other severity buttons with ":enabled:hover" to have a "background-color" rule in the Poseidon _forms.scss style sheet. We've tried it but took more effort than expected initially, we'll give it another go in next release. As there are many themes, it will take a bit of time to add support for all of them. But Poseidon 5.0 is due next week so we'll work on it. Version 5.2.0 has same issue. Severity buttons are supported by Poseidon 6.0. Please try the new version. I've upgraded to PrimeNG to 6.1.2 and theme to 6.0 and now my styles doesn't work as should. Theme CSS and layout CSS are loaded on runtime (color is picked from configuration file). I've checked your demo page and I'm not sure from where this "secondary" style comes.